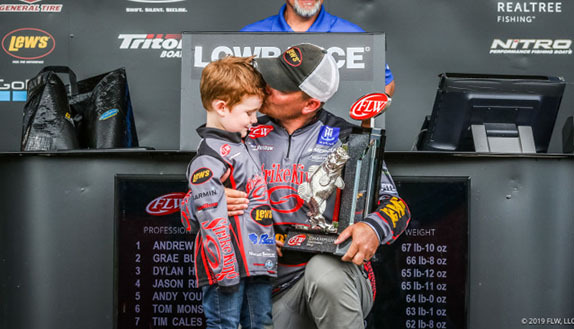 Two late culls lifted Andrew Upshaw to victory at the Cherokee Lake FLW Tour. It’s never a bad thing to have a backup plan. 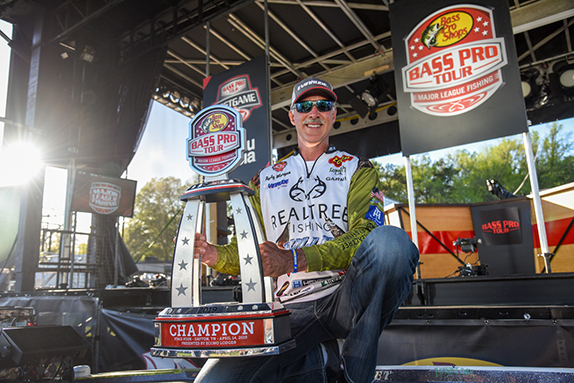 For Andrew Upshaw, having one sealed his first FLW Tour victory. 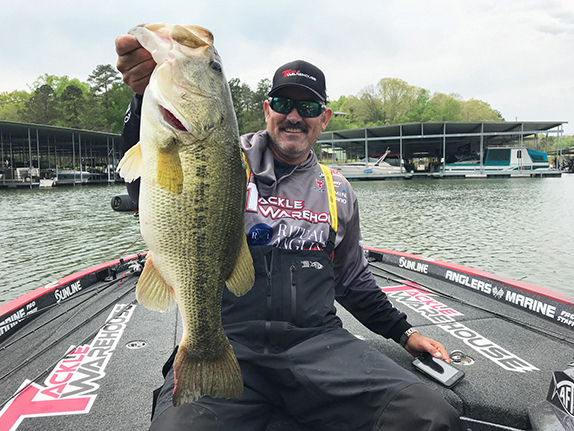 With 45 minutes left in the event Cherokee Lake, Upshaw abandoned his spawning-smallmouth pattern that had him leading for three days and went to a secondary pattern he’d been saving. His risky move paid off with 3 1/2- and 2 1/2-pounders that gave him two final culls with less than 30 minutes left. 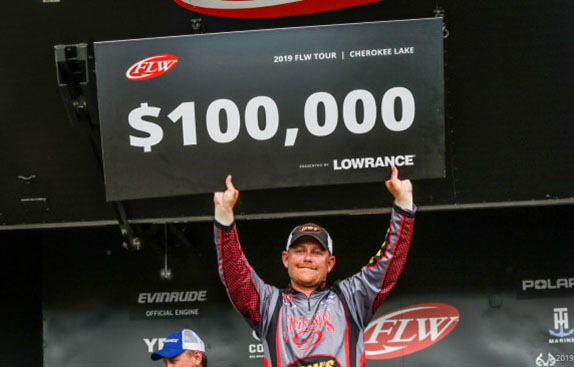 In what was a tight tournament throughout, Upshaw would come to need those precious ounces to hold off Grae Buck’s big final day. Those last two fish pushed his final-day bag to 15-06, giving him 67-10 for the tournament. Buck certainly made Upshaw with a 17-04 bag that jumped him up into 2nd. Meanwhile, Dylan Hays only got one big bite on his largemouth pattern up the river, and had to settle for 3rd. Jason Reyes brought in the biggest bag of the day (17-08) to climb to 4th, while Andy Young stood pat in 5th thanks to a 15-00 bag. Tom Monsoor’s swimjig bite seemed to die today, as he fell to 6th after bringing in just 12-07 today. Rounding out the top 10 were Tim Cales, Derrick Snavely, Matt Becker and Tim Frederick. After day 3, Upshaw planned on actually starting on his back-up plan today – an offshore pile of boulders he’d located while “practicing” late on day 2 of the event, after he’d long secured his weight for the day. Yet, just before takeoff he decided he’d ride one last time with his spawning smallmouth. At times throughout his “super stressful” day he’d come to second-guess that decision, though. He caught a quick limit of smallmouth on a wacky-rigged Strike King Ocho, pitching it to key areas of rock that deflected the current. Yet, late in the morning more rain hit the lake, followed by plenty of wind; all of which seemed to kill the bite. Upshaw would go six hours without culling up a single ounce despite not having a huge bag. Grae Buck had a solid bag by 9:15 a.m., but couldn't upgrade throughout the remainder of the day. Hence the move to his offshore rocks, which were only a half-mile from takeoff and were on the side of a point leading into a prime spawning area. He figured it would replenish, and it did just enough, as he caught those last two decent fish on a swimbait to seal his victory. Buck was on an almost identical pattern as Upshaw, keying on giant boulders that created “walls” to block current. Buck also had issues upgrading today, though, for an entirely different reason than Upshaw. Hays’ day started even better than Buck’s, as he cracked a 4-pounder first thing in the morning flipping a homemade half-ounce jig to rocks and laydowns in a small creek far up the river. “When that happened, I thought it was going to be a great day,” Hays said. Unfortunately, it just wasn’t meant to be. Keying on channel swings and steep banks, he never got another big bite, and he was only able to fill out the rest of his limit with decent-sized largemouth while lamenting the third kicker he lost yesterday. > Day 4 stats – 10 anglers, 10 limits. 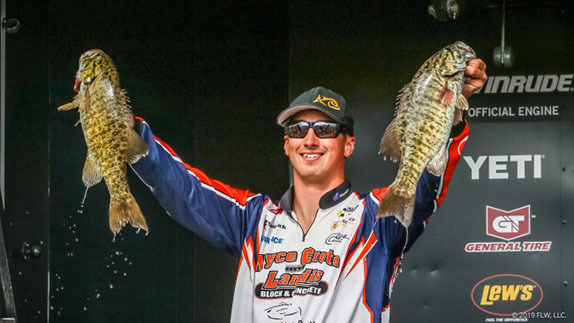 > Rookie Miles Burghoff, who finished 46th in the event, is the new Angler of the Year points leader. He has a 17-point edge over 2015 AOY Scott Martin.